In a career that has spanned four decades, choreographer Twyla Tharp has collaborated with great musicians, designers, thousands of dancers, and almost a hundred companies. She's experienced the thrill of shared achievement and has seen what happens when group efforts fizzle. Her professional life has been - and continues to be - one collaboration after another. 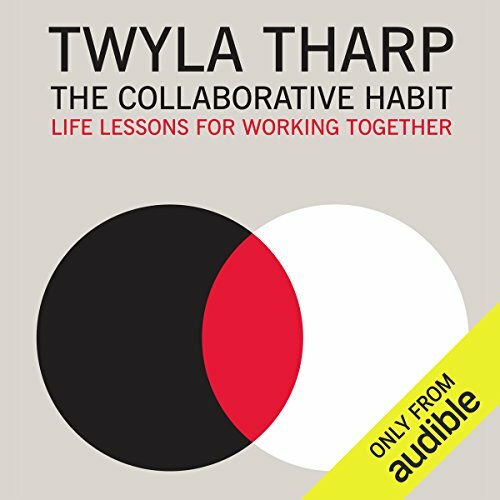 In this practical sequel to her national best seller The Creative Habit, Tharp explains why collaboration is important to her - and can be for you. She shows how to recognize good candidates for partnership and how to build one successfully, and analyzes dysfunctional collaborations. And although this isn't a book that promises to help you deepen your romantic life, she suggests that the lessons you learn by working together professionally can help you in your personal relationships. These lessons about planning, listening, organizing, troubleshooting, and using your talents and those of your coworkers to the fullest are not limited to the arts; they are the building blocks of working with others, like if you're stuck in a 9-to-5 job and have an unhelpful boss. Tharp sees collaboration as a daily practice, and her book is rich in examples from her career. Starting as a 12-year-old teaching dance to her brothers in a small town in California and moving through her work as a fledgling choreographer in New York, she learns lessons that have enriched her collaborations with Billy Joel, Jerome Robbins, Mikhail Baryshnikov, Bob Dylan, Elvis Costello, David Byrne, Richard Avedon, Milos Forman, Norma Kamali, and Frank Sinatra. Nothing forces change more dramatically than a new partnership. In a good collaboration, differences between partners mean that one plus one will always equal more than two. A good collaborator is easier to find than a good friend. If you've got a true friendship, you want to protect that. To work together is to risk it. Everyone who uses e-mail is a virtual collaborator. Getting involved with your collaborator's problems may distract you from your own, but it usually leads to disaster. When you have history, you have ghosts. If you're returning to an old collaboration, begin at the beginning. No evocation of old problems and old solutions. Tharp's conclusion: What we can learn about working creatively and in harmony can transform our lives, and our world. ©2009 W.A.T. Ltd. (P)2013 Audible, Inc. It is a testament to how badly I wanted to hear what Twila had to say, that I was willing to sit through Lauren Fortgang's narration. There is a falseness to her sophisticated clarity and enunciation. Her sophistication feels like arrogance. This is NOTHING like Twila's deeply intelligent and sophisticated yet totally natural and down-to-earth spirit and manner. I thank heavens this woman is not my mother. I wish The Creative Habit too could be recorded over again, as this is a book I would like to keep coming back to. Some good points about working creatively with others, esprcially in bigger productions (creating ballets). Glad i got it, if not just to get familiar with the stories about working with musicians, etc. and how she dealt with problems that came up. Enjoyed. I liked her book The Creative Habit a lot better. This is interesting because it melds art and business. Tharp takes herself and her work very seriously, and is not just an artist but also understands the business side of things. Her books should get more attention in general but since I'm now the "lead parent" (i.e., SAHM) I just wasn't in the mood for a book on business. in this book at all, however I really enjoyed the book.